One of the coolest things about stand up paddle boarding is the fact that anyone can hop on a board and start paddling. There’s really no learning curve to the sport, and there are many health benefits associated with stand up paddle boarding such as increased core strength, weight loss, and improved muscle tone, just to name a few. 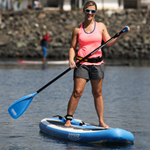 Paddle boards tend to be a bit awkward to carry and they’re definitely on the heavy side due to their large size, but these days, you can buy inflatable paddle boards that are nearly as stiff as a hard board and weigh far less. Inflatable SUP boards can also be packed down into a backpack and taken anywhere — you can even fly with them and check them with your check-in luggage. If you’re interested in going this route, it’s best to spend some time reading inflatable paddle board reviews before buying anything as there are a lot of options available. Although the sport is extremely easy to pick up, it’s not a bad idea to take a lesson if you’re just starting out. This will fill you in on some basics and you’ll also learn a bit about SUP safety. Overall, stand up paddle boarding is a great sport that is perfectly suited to the Tampa area. It’s a ton of fun and something that all ages can enjoy! To learn more about the Sunshine State’s incredible SUP scene, you can download this free Florida paddle boarding guide from InflatableBoarder.com.